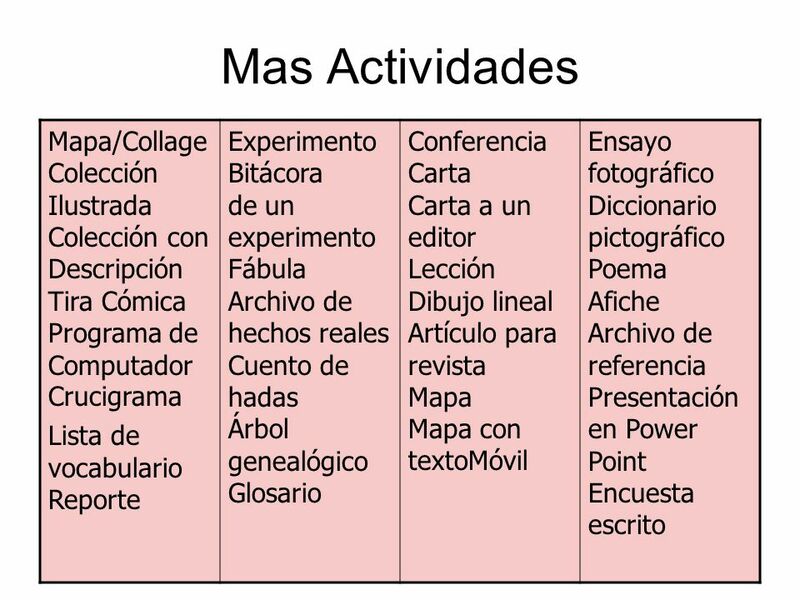 Los alumnos reconocen datos fuera del contexto Énfasis en forma Limitada en su forma de contestar Los alumnos practican ‘cramming’ Los maestros consideran los exámenes como imposiciones Respuestas correctas están importantes Evaluación autentica Los alumnos aplican sus conocimientos Énfasis en contenidos Abierta a muchas circunstancias Los alumnos aprenden conceptos al aplicarlos. Hábitos de pensamiento y justificación del proceso están importantes. 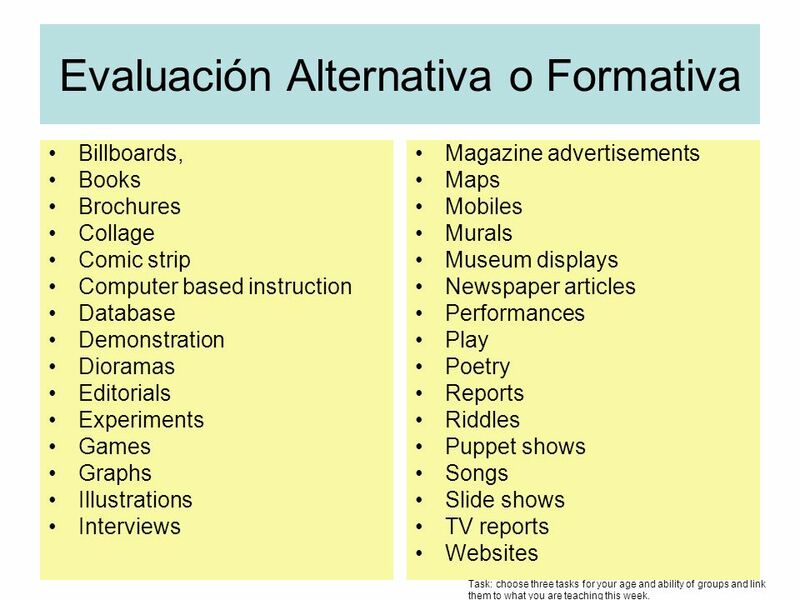 Authentic assessments require students to be effective performers with acquired knowledge. Traditional tests tend to reveal only whether the student can recognize, recall or "plug in" what was learned out of context. Conventional tests are usually limited to paper-and-pencil, one- answer questions. it is the form, not the content of the test that is harmful to learning Students come to believe that learning is cramming; teachers come to believe that tests are after-the-fact, imposed nuisances composed of contrived questions--irrelevant to their intent and success. Both parties are led to believe that right answers matter more than habits of mind and the justification of one's approach and results. 3 Evaluación autentica Life is mostly an open book test. La vida es como un examen con libro abierta…entonces por que no podemos referir al libro durante un examen? Billboards, Books Brochures Collage Comic strip Computer based instruction Database Demonstration Dioramas Editorials Experiments Games Graphs Illustrations Interviews Magazine advertisements Maps Mobiles Murals Museum displays Newspaper articles Performances Play Poetry Reports Riddles Puppet shows Songs Slide shows TV reports Websites Task: choose three tasks for your age and ability of groups and link them to what you are teaching this week. 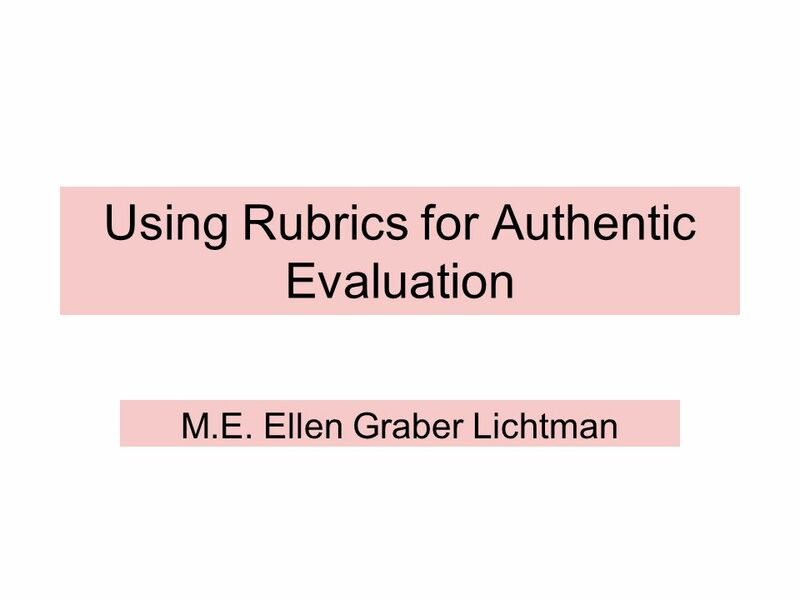 Descargar ppt "Using Rubrics for Authentic Evaluation"
Hola clase Spanish 4 No estoy aqui hoy. Espero que esten bien. Science Meeting Junta de la Ciencia March 3, de marzo 2009 Bridges Academy at Melrose March 3, de marzo 2009 Bridges Academy at Melrose. HOW TO TEACH…. I´m ready! ha sido diseñado para ayudar a los alumnos a idealizar la existencia de una lengua diferente a la de ellos y a familiarizarse. What does History mean to you? Pick three words to describe what History Means to You. ◦Ex) Tradition ¿Qué significa la historia para usted? ◦ Escoge tres. The Perfect Tense. How do you form the perfect? The perfect tense is formed by using the correct form of the helping verb (haber) together with the past. 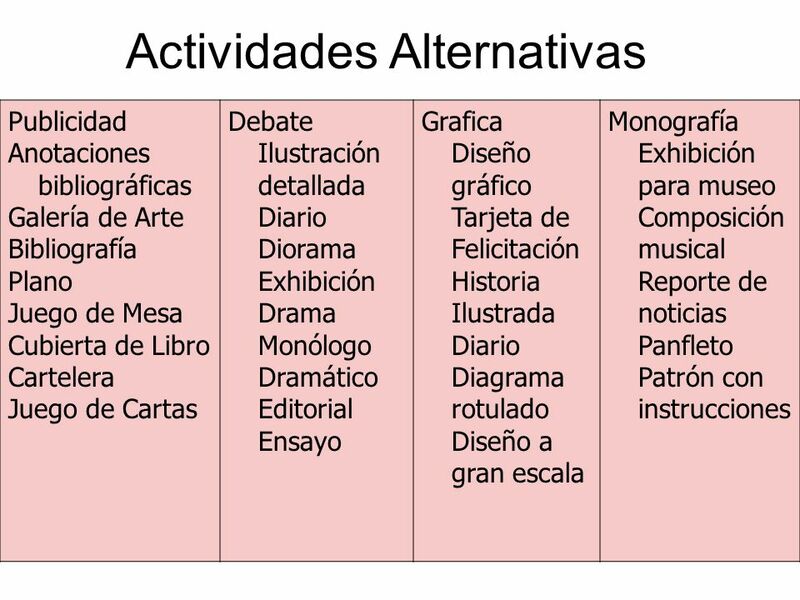 Parte Español: ¿A dónde vas durante tu tiempo libre? ¿Qué haces? ¿Qué películas te gustan? ¿Qué comes en tu casa? ¿Cuál es la comida típica de los Estados.